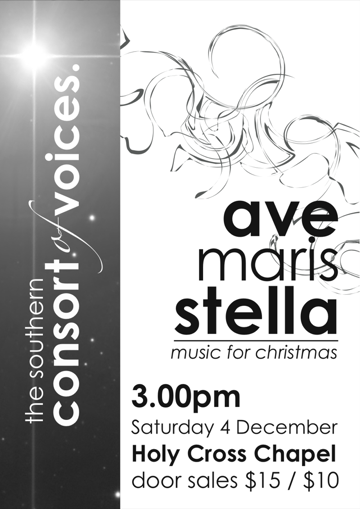 Southern Consort of Voices will perform its Christmas concert at St Paul’s Cathedral on Saturday 1 December at 7.30 pm. We are singing a contemporary programme, with a bracket of beautiful Elgar choral works thrown in for good measure. 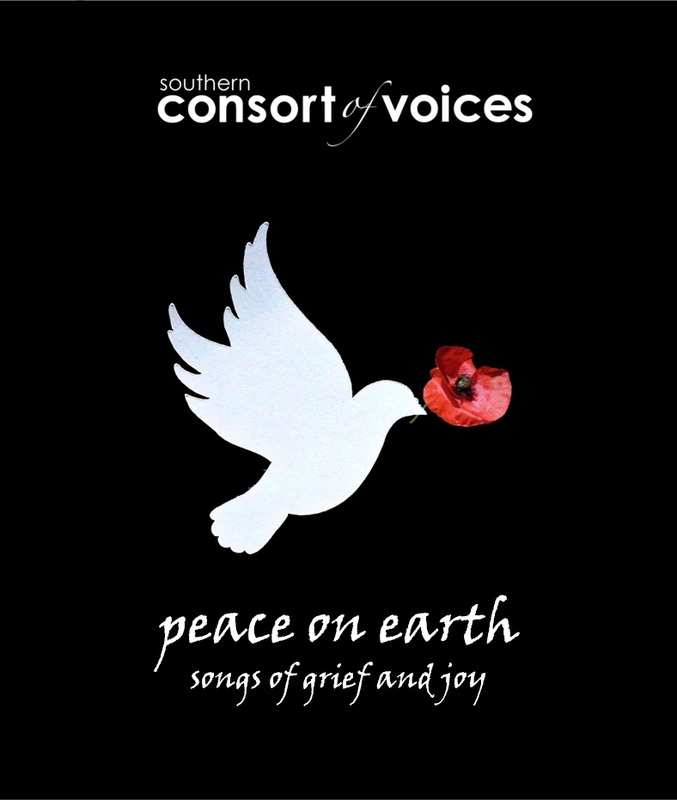 The overarching title, “Peace on Earth”, unifies three main sections in the programme. The first of these consists of a number of Marian texts, honouring Mary and heralding the arrival of the Christ-Child. These include pieces by New Zealand composers such as Ka Waiata ki a Maria by Richard Punaki and Salve Regina by David Childs. The two other items in this bracket are very recent compositions, namely Maria durch ein Dornwald ging by Stefan Claas and Ave Maris Stella by Philip Stopford. The theme of the second section is remembrance, dedicated to the fallen in World War 1. Beginning with the richly-arranged anthem Abide With Me, the remainder of the set is made up of three wonderfully expressive Elgar pieces, including a moving setting of Lux Aeterna using his famous Nimrod theme, the sombre They Are At Rest, and the forlorn poem My Love Dwelt in a Northern Land. The third section highlights Christmas themes such as light, love, birth, and rejoicing. Amongst the selection is an enormous variety of compositional styles. Indeed, only a couple of items could rightly be described as carols (Gaudete and Nova Nova!). The pieces are gorgeously crafted, such as Ešenvald’s Ubi Caritas and O Salutaris Hostia which features an enchanting soprano duet from guests Naomi White and Catherine Daly-Reeve. They will then be joined on violin by Dunedin’s own gem, Sydney Manowitz, and his talented pupil, Rikke Kikkawa-McLeod, with Michael Winikoff on piano to perform a little-known but charming Elgar piece entitled A Christmas Greeting. Kikkawa-McLeod will also perform a solo item by Brahms. New pieces from English composer Paul Mealor, Locus Iste, and our very own Michael Winikoff, Lux, provide interesting and contrasting choral textures in our programme. Spring seems to have arrived early. To celebrate, Southern Consort is experimenting with a new genre of music. Our repertoire for this concert is an eclectic mixture of World Music, with contrasting moods and settings, and a variety of languages to boot. The works vary in style, from beautiful Afro-American spirituals to charming carols from Hungary and Argentina, through well-known national songs such as Danny Boy and our very own Ka Waiata ki a Maria, to energetic rounds from South Africa and Kenya. There is also a recent composition which overlays a traditional Saami joik with a Norwegian hymn, and a contemporary Canadian work by a talented Armenian immigrant. A gorgeous English folk song by Gustav Holst and a cherubic hymn sung in Church Slavonic are also included. 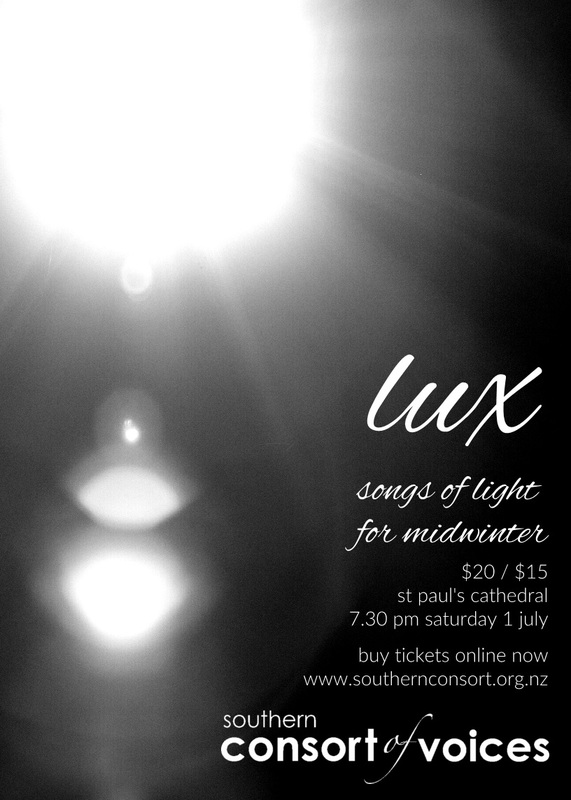 From New Zealand we have composers Michael Winikoff with a contemplative composition to the words Lux et Spes and David Childs with the lively Marian antiphon Salve Regina. We present three more modern composers from further afield: American Kurt Knecht with his love song Sero Te Amavi, American Eric Whitacre with Lux Aurumque, and Welshman Paul Mealor with his 2011 Royal Wedding composition Ubi Caritas. Abendlied by Josef Rheinberger, Ave Maris Stella by Edvard Grieg, Beati Quorum Via by Charles Stanford, and the eight-part madrigal Great God of Love by Pearsall celebrate the beautiful harmonic tradition of 19th Century European music. The early twentieth century is represented by the Russian composer Alexander Sheremetev with his stirring anthem for male voices Now the Powers of Heaven, and Elgar’s My Love Dwelt in a Northern Land. 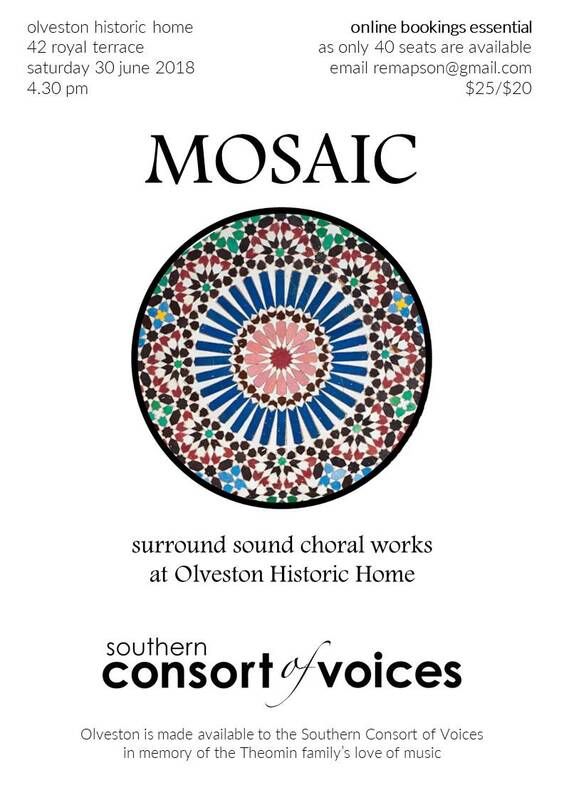 Olveston is made available to the Southern Consort of Voices in memory of the Theomin family’s love of music. We very much hope you can join us. We’re back for 2018! Sunday 27th May will be The Nook & Cranny Music Festival​ number 3! Dunedin’s own unique music festival with a difference. 50+ performances, hidden in the nooks and crannies of the Dunedin Public Libraries​. Lock it into your calendar, share and invite your friends for the biggest showcase of original Dunedin and New Zealand music, all for free during NZ Music Month! All ages, all types of music. It has been a long time since the Southern Consort has performed a programme of English madrigals. During rehearsals, we are rediscovering the charm and subtlety of both the madrigal poems and their superb settings by a number of master composers. Throughout this selection of madrigals, there is a plentiful use of clever word painting while imaginative polyphonic writing is used to convey the texts’ meaning. The pieces range in mood from the lament of lost love to the intensity of new romance, from the pain of rejection to the comfort of a lullaby, and from the sorrow of death to the risqué celebration of springtime. Some of the most famous English madrigal composers are included, such as Morley, Byrd, Bennet, Farmer, Wilbye, and Gibbons. In the second half of the programme, we will perform a set of beautiful motets, also by English composers. Three are from the Renaissance era (by Phillips, Tallis and Tomkins) while the others hail from the late 19th and early 20th century (by Stanford, Britten and Elgar). The contrast in style is telling, with the expressiveness and complexity of these pieces contrasting with the simpler, more direct emotions conveyed by the deft madrigals. We hope you can join us for our inaugural recital at Hanover Hall. Take some time out to enjoy some fine Christmas music – without the schmaltz! With few traditional carols, this programme is full of vitality and features sublime Yuletide works by master composers including Mendelssohn, Tallis, Britten, Lauridsen and Whitacre. Featuring guest soloist Courtney Hickmott, who won the Classical Vocal Scholarship at the Dunedin Junior Vocal Competition 2017. A concert for children of all ages! One of the most enjoyable parts of being in Southern Consort is singing a wide variety of genres and styles. This concert gives us a chance to let our hair down and present a children’s programme of choral music. But don’t be deceived! Some of the music is tricky, requiring good vocal technique and musical dexterity. Some of the pieces are in 6 or 8 parts, and are as challenging as anything we have sung. This is a concert to enjoy for adults and children alike. 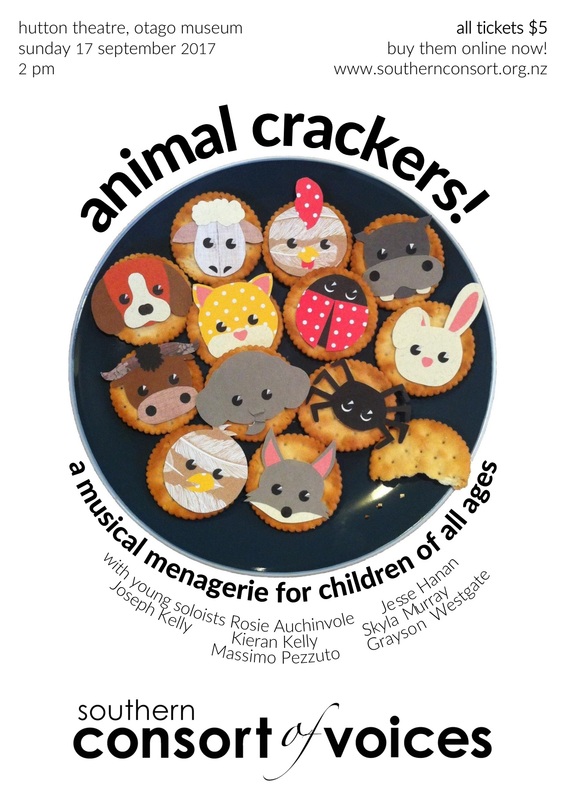 The theme is “Animals” and the programme includes songs about 20 different creatures such as cats, dogs, roosters, elephants, frogs and even a Big Bad Wolf. The styles vary from Nursery rhymes to bird song, barbershop to laments, and protest songs to humour. Even Ernie’s Rubber Duckie song is featured. And those of you who enjoy the gentle humour of Flanders and Swann will be in for a treat as we sing about a Gnu, a Hippopotamus and a Spider. Another appealing aspect to the concert is the bracket of child soloists, who will each sing a song about their selected animal. Each child has won numerous awards at singing competitions over the years. Be prepared to be charmed! The concert will run for about an hour and should be fun for the whole family. 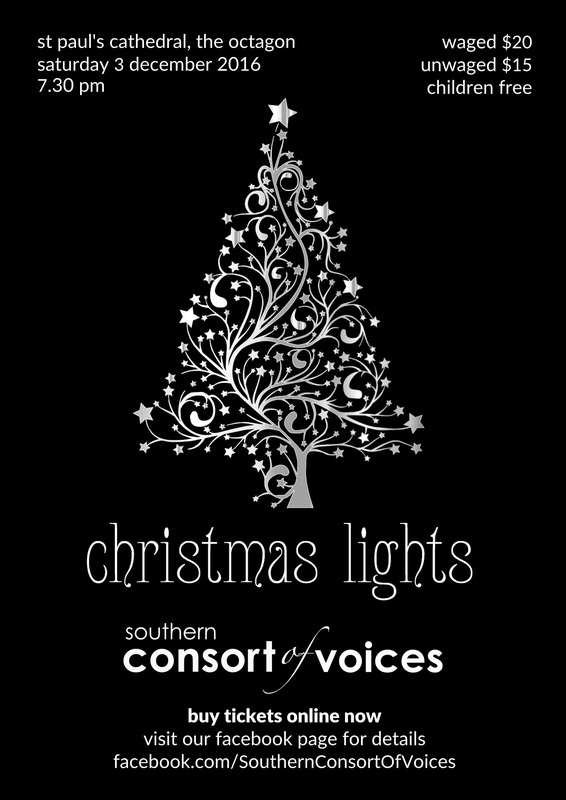 Southern Consort of Voices will present a charming concert of choral pieces based on the theme of light. Aptly timed near the winter solstice, the pieces all contain text which describes or alludes to the inspiration of light. Several of the pieces are motets and range from a stunning double-choir piece from the Rennaissance by Palestrina, O Surge Illuminare Jerusalem, through to beautiful modern works by leading contemporary composers such as MacMillan, Gjeilo, Lauredsen, Whitacre and Ešenvalds. (Ešenvalds is the guest composer at the upcoming Choral Connect event in Auckland). Our programme also features two New Zealand works, namely Lux Aeterna, a ground-breaking piece by David Hamilton, and the wonderfully crafted O Nata Lux by David Childs. In the middle of the programme, we showcase saxophonist Elliot Tay and cellist Nisa Jaafar, who will each play solo lines against the choir accompaniment in two pieces: the mesmerising O Nata Lux by Tallis and the moving Gabriel’s Oboe by Morricone (from the film The Mission). A couple of highlights include Elgar’s haunting Nimrod theme, entitled Lux Aeterna and arranged for 8 voices, and Ešenvald’s Stars which features the eerie sound of wine glasses to convey a sense of celestial light. Come and join us for an evening of light and music in the midst of winter. The Nook & Cranny Music Festival is a part of the NZ Music Month activities which are provided in a collaboration between Dunedinmusic.com, Dunedin Public Libraries, The Mentalist Collective and Strawberry Sound. Aside from a very small amount of grant funding from the Creative Communities Scheme, the whole month is planned, organised and carried out entirely on good will. New Zealanders as a whole are terrible at celebrating the talent in our own backyard, and often don’t recognise talent before it is popular overseas. Our mission is to showcase the musical talent that is in Dunedin – to focus and promote our music community to the general public, so every New Zealander has a local favourite they regularly support. 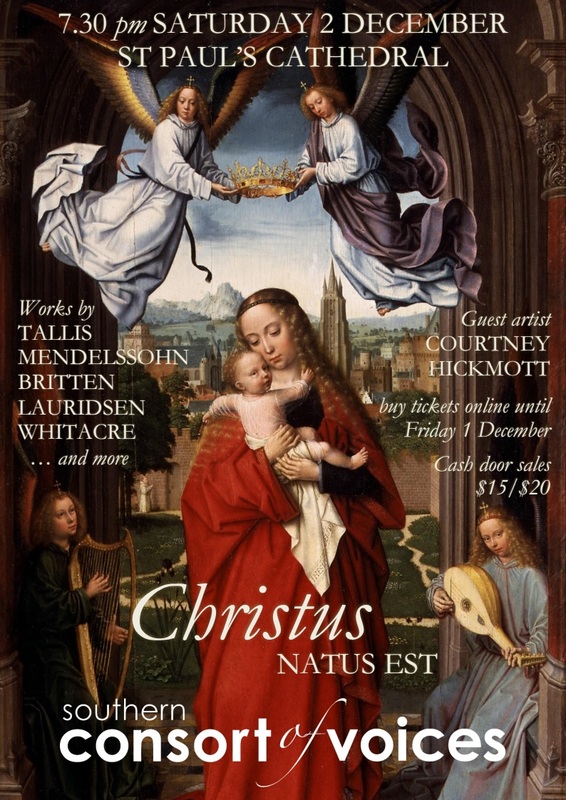 Southern Consort of Voices will present a concert of stunning Lenten and Easter motets, chiefly from the Renaissance era. The repertoire includes works by Tallis, Victoria, Lotti, Lobo, Tomkins and others. The title of the concert, “O my Son”, is a phrase from When David Heard by Thomas Tomkins. It is one of the most moving pieces in all of the Rennaissance era, with the angst of the David evident in the various phases of the piece, reflecting different aspects and stages of his grief. Other highlights include Lotti’s Crucifixus, an eight-part tour de force with its gorgeous dissonances and suspensions, and Lobo’s Versa Est in Luctum, which is a superb example of polyphonic writing in a funeral setting. The works by Tallis are outstanding, too, including the final section of his famous Lamentations of Jeremiah. Tallis’ Miserere Nostri features a beautiful canon sung by the sopranos alongside five other parts providing the foundation and ornamentation. The concert will conclude with his lively Pentecost piece Loquebantur, also in seven parts, in which the tenors provide the cantus firmus while the complexity of surrounding voices conveys the disciples speaking in tongues. We are delighted to have our guest soloist, Anna Thomson (soprano) sing for us. She will be accompanied by Tom McGrath from the University of Otago Music Department. Anna will perform a bracket of solo songs from the Renaissance/Baroque era, followed by a short work by Scarlatti with the Southern Consort. 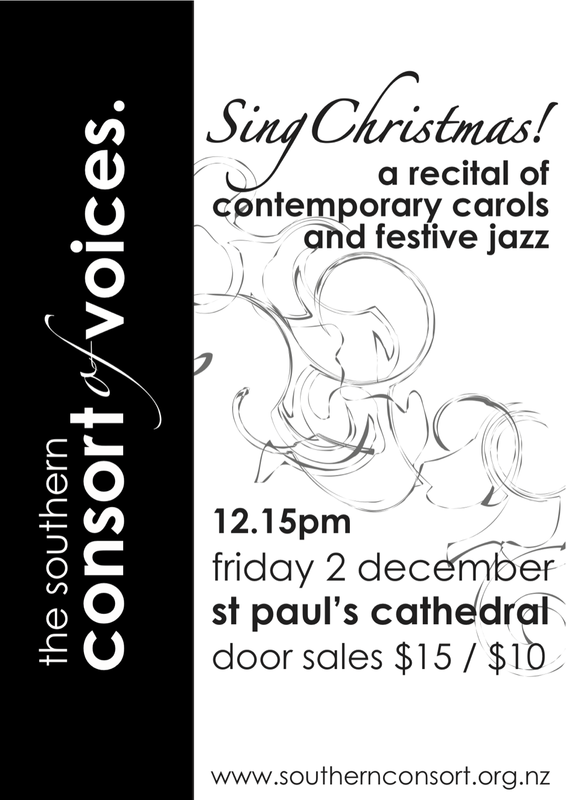 Come join the Southern Consort of Voices in a glorious celebration of Christmas and Light! The concert includes a number of works that use rich shimmering chords to portray different facets of light, including Whitacre’s famous Lux Aurumque, Childs’ O Magnum Mysterium, and Ešenvalds’ Ubi Caritas et Amor, O Salutaris Hostia, and Stars. The last of these pieces is accompanied by 6 wine glasses which should produce a magical sound in the resonant acoustic of St Paul’s cathedral. The concert also features three Romanian Christmas carols, Chilcott’s The Shepherd’s Carol with its beautiful melodic opening and rich harmonies, and Kodály’s masterful arrangement of the well-known traditional Veni, Veni Emmanuel​. In addition to the slow and the beautiful, the choir will also perform two pieces bursting with rhythmical energy: Chilcott’s Nova! Nova! and Hamilton’s ​Ecce Beatam Lucem. 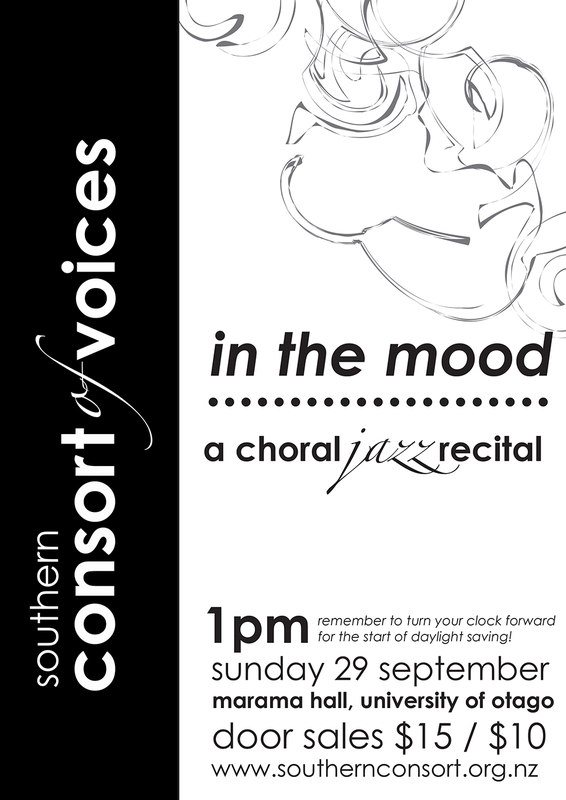 Join the Southern Consort of Voices for a warm afternoon of hot jazz! 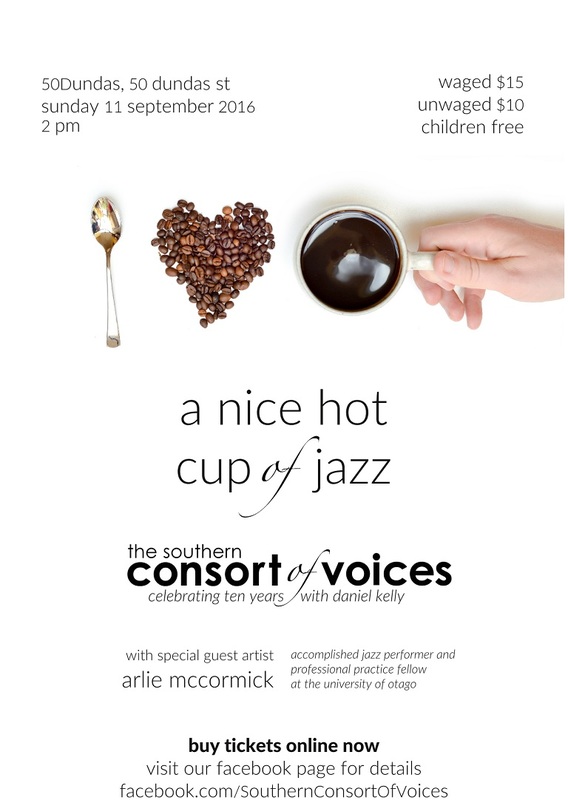 Southern Consort will be joined by the amazing voice of the University of Otago’s Arlie McCormick. Featuring favourites including Joe Garland’s In the Mood, Fats Waller’s Ain’t Misbehavin’, Cole Porter’s Let’s Do It, Irving Caesar’s Tea for Two, Jacques Prevert’s Autumn Leaves, and Gershwin’s ‘S Wonderful and Summertime. Also featuring some Swingling, Java Jive, and a possible guest appearance by a yellow duck. 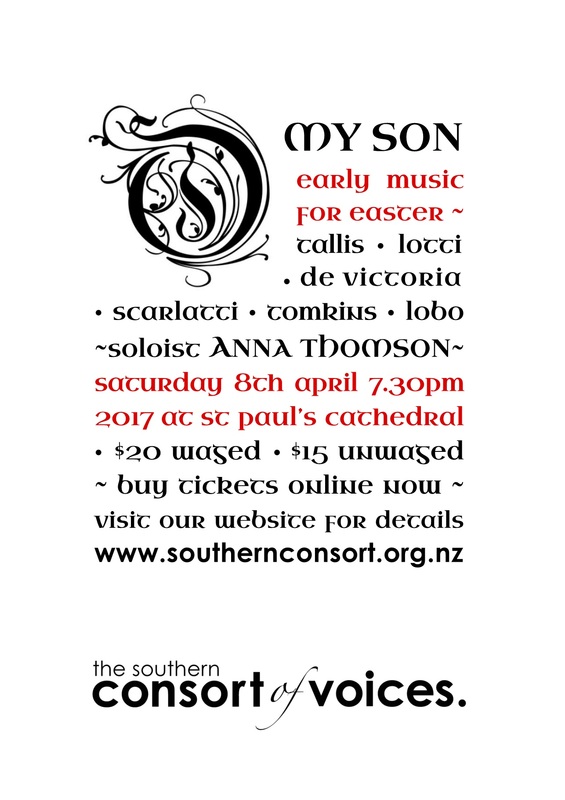 Southern Consort of Voices celebrates New Zealand Music Month with a selection of pieces by Otago composers. Our programme features Richard Madden’s Christmas carol Balulalow and Christopher Marshall’s triptych of Emily Dickinson poems, along with multiple pieces by premiere Otago classical composer Anthony Ritchie: of note are Song of Hope, commemorating the bravery of the survivors of the 1968 Wahine disaster, and Piano Practice, which was commissioned for an earlier Southern Consort concert. In addition to these established composers, we present Ave Maria by rising star Corwin Newall and works by our own choir members Michael Winikoff and Tim C. Hurd. 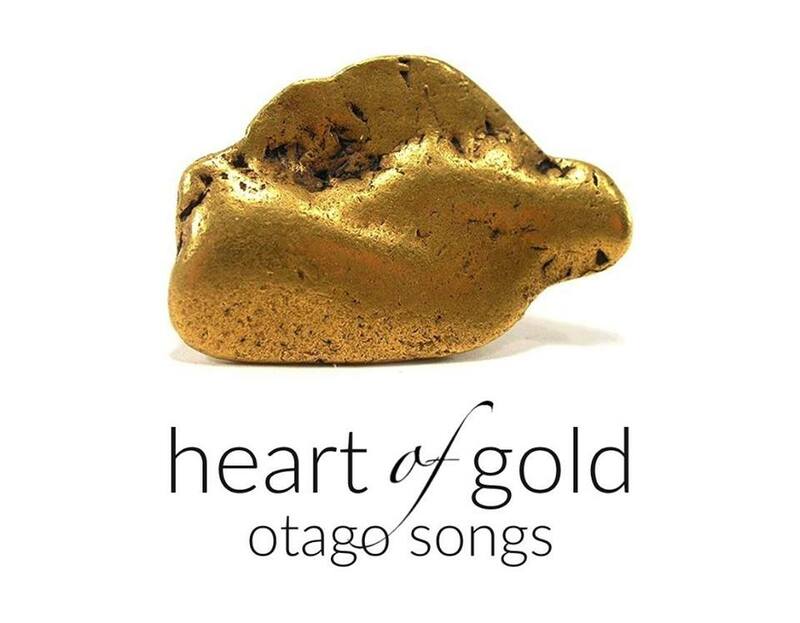 Don’t miss the first ever performance of our new choral rendition of Ōtākou, a lament and celebration of the wildlife of the Otago Peninsula by Dunedin’s greatest folk singer-songwriter, the late and much-missed Marcus Turner. 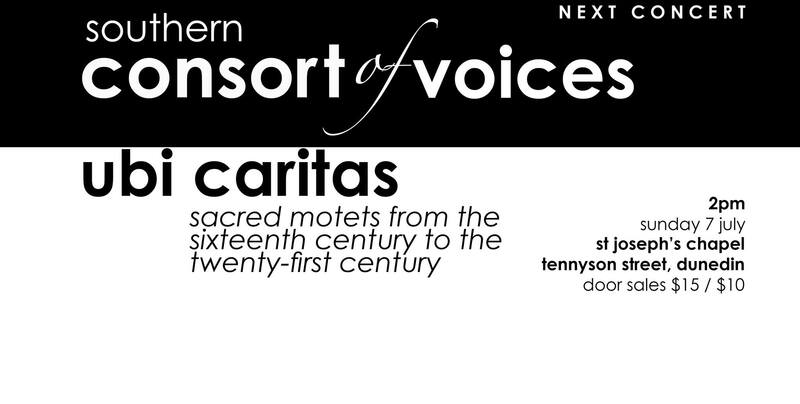 Southern Consort of Voices presents a concert showcasing glorious a cappella Spanish and Italian works from the Renaissance period. The diverse programme includes celebratory works such as Exsultate Deo and Canite Tuba (both by Giovanni da Palestrina), as well as the darker and more reflective Versa est in Luctum (Alonso Lobo). A centre piece of the programme is Tomás de Victoria’s Requiem, with its glorious soaring harmonies and sublime dynamic undulations. Carlo Gesualdo da Venosa’s Miserere provides harmonic spice with its unusual shifts in harmony. Come join us for an evening of fine multi-part choral singing celebrating the unique sounds and compositional genius of Renaissance choral music. 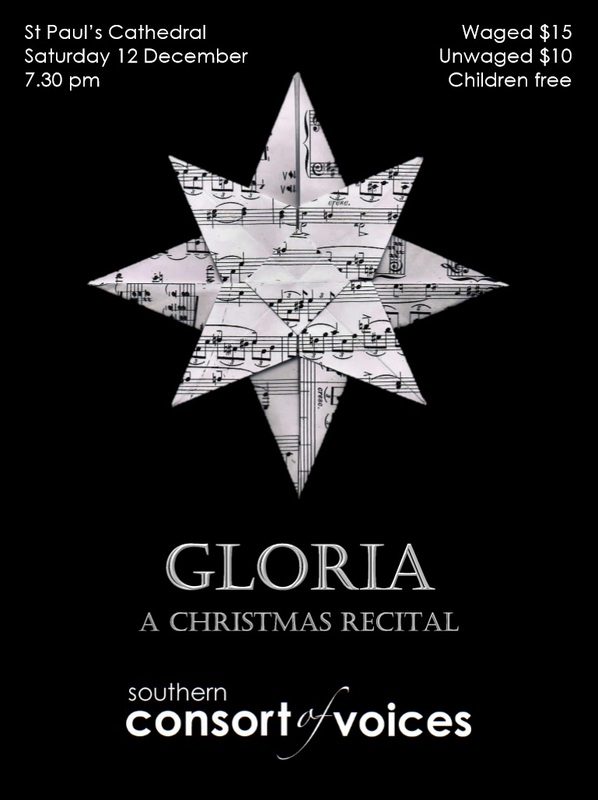 Join the Southern Consort of Voices in a choral celebration of Christmas from across the globe and the years! 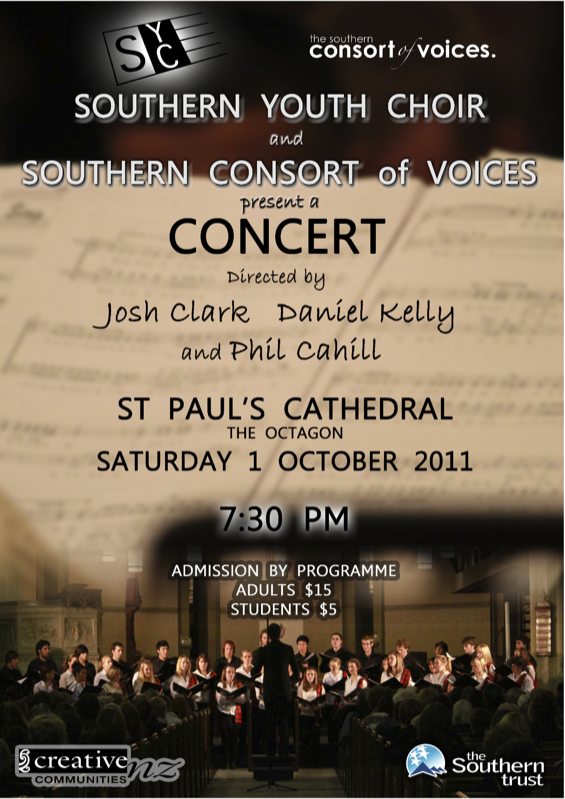 The concert features a wide range of works including Russian masterpieces by Rakhmaninov and Tchaikovsky, Eric Whitacre’s shimmering Lux Aurumque (famous for its performance by the Virtual Choir, featuring over 180 singers from across the globe), arrangements of carols (Gaudete, I Wonder As I Wander, and the Huron Carol), and other choral delights. 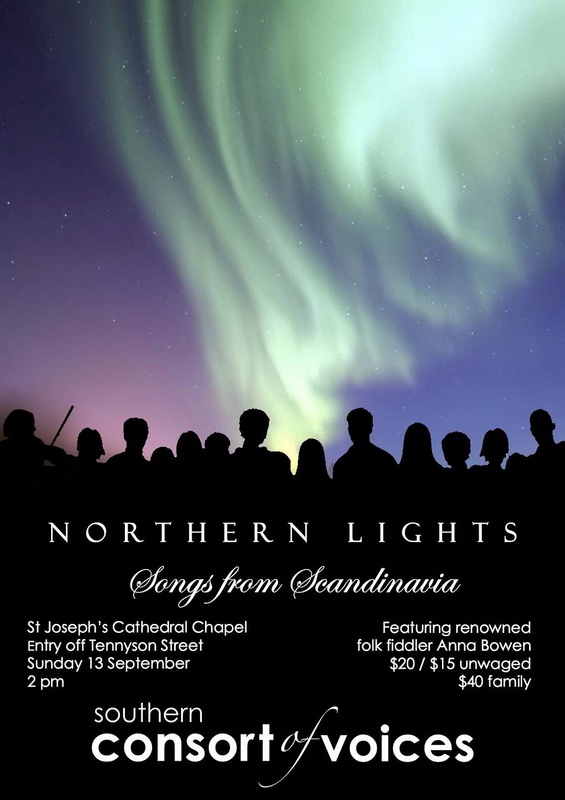 Southern Consort of Voices is pleased to announce their upcoming concert Northern Lights, featuring sacred and folk tunes from Scandinavia. The programme includes a number of famous pieces by well-known composers such as Edvard Grieg (Norway) and Jean Sibelius (Finland), as well as beautiful modern works by Fredrik Sixten (Sweden), Knut Nystedt (Norway) and Jan Sandström (Sweden). One of Sixten’s works is the moving Peace which is dedicated to the victims of the 2011 Norwegian massacre, while Sandström’s arrangement of Es ist ein Ros entsprungen employs the use of surround sound and a semi chorus singing the original work by Michael Praetorius. The effect should be wonderful in the chapel! We are also performing classical choral renditions of a variety of Norwegian folk pieces arranged by leading choral director Grete Pedersen. 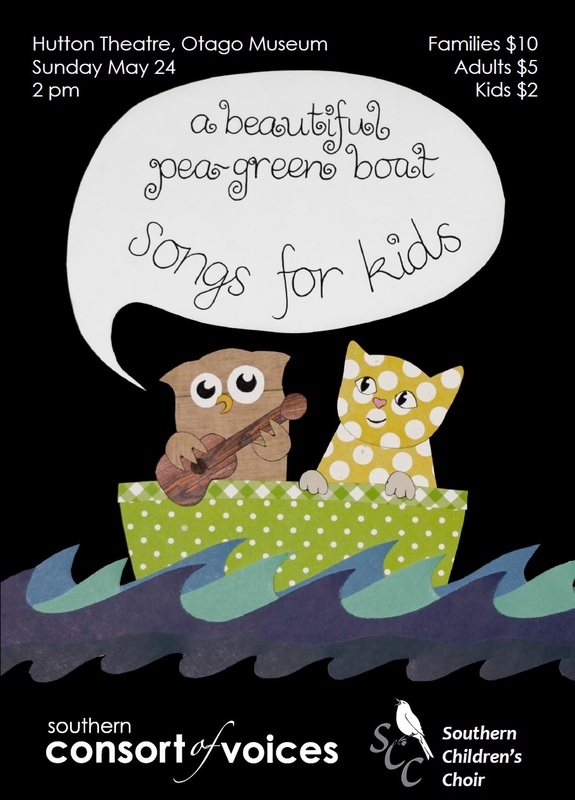 These catchy tunes are energetic and uplifting, and sure to put a smile on the face of the listeners. To this end, we are delighted to include Dunedin’s celebrated folk fiddler Anna Bowen, of Catgut & Steel fame, who will perform a bracket of Scandinavian folk tunes as well as join us on the Pedersen pieces. This concert is a unique venture in the Southern Consort’s history. It features charming, deft arrangements of nursery rhymes and lots of sound effects for kids and adults alike to enjoy, such as Martin Wesley-Smith’s 6-part Chuffa Luffa Steam Train and The Elderly Elephant. The Southern Children’s Choir will also sing a bracket of songs including Mozart’s ‘go-cart’ and an action song with real gloves. The concert will conclude with two combined items: a Norwegian piece from the movie Frozen and the pop song Happy. 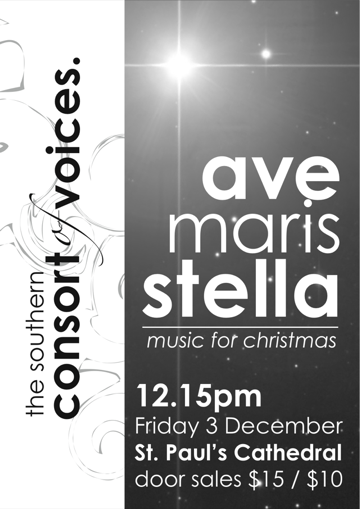 Southern Consort of Voices presents a programme of Christmas music from the twentieth and twenty-first centuries, ranging from Morten Lauridsen’s haunting O Magnum Mysterium to David Hamilton’s dramatic Ecce Beatam Lucem. George Chittenden, St Paul’s musical director, will accompany us on our title piece, What Sweeter Music by John Rutter. Other items of note include John Tavener’s The Lamb and Eric Whitacre’s Lux Aurumque. In pride of place, we feature Jack Body’s polyphonic Carol to St Stephen (in 16 parts) with solo soprano (Catherine Daly-Reeve), mezzo (Cherie Stayner) and tenor (Ben Madden). This remarkable piece starts with a simple medieval carol in 2 parts, progressing into a canon for lower voices in 8 parts, and finishing with a free canon for 16 voices and the 3 soloists. Ben Madden, a tenor with the National Youth Choir, will be performing as a soloist on several additional items such as Franz Gruber’s Silent Night (in 8 parts) and Herbert Howell’s A Spotless Rose. 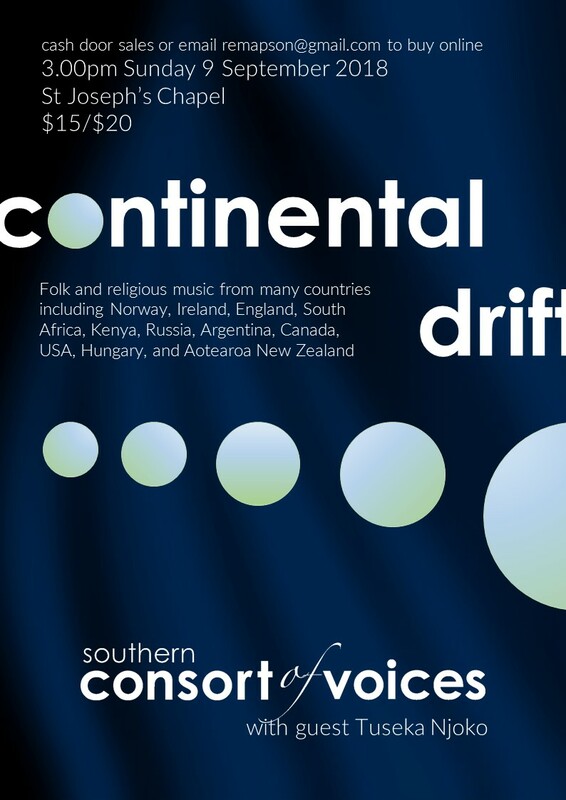 Southern Consort of Voices presents a selection of choral works from 16th to 21st centuries, with stereo and soundscape effects. We have selected a variety of pieces to take advantage of the large resonant space. You will hear pieces such as Mendelssohn’s famous Kyrie, with the sound washing back and forth between two choirs; other pieces, notably Thomas Tallis’ Loquebantur Variis Linguis and Miserere Nostri, produce a veritable ’soundscape’ as the voices emanate from various points within the Art Gallery. The repertoire includes some modern pieces including Kodaly’s sublime Esti Dal and Eric Whitacre’s glowing Lux Aurumque. Come along and treat yourself to half an hour of beautiful singing and surprising choral effects. 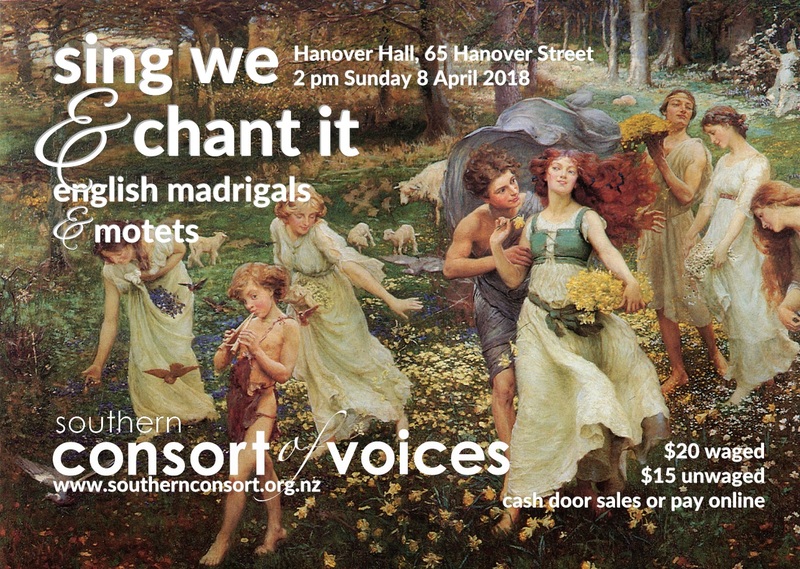 The Southern Consort of Voices’ next concert features music on the theme of light, hope, and heaven, spanning a wide range of time periods and styles, from highly reflective and cordial works of Tallis and Byrd to dynamic pieces by contemporary NZ composers. We look forward to seeing you there. 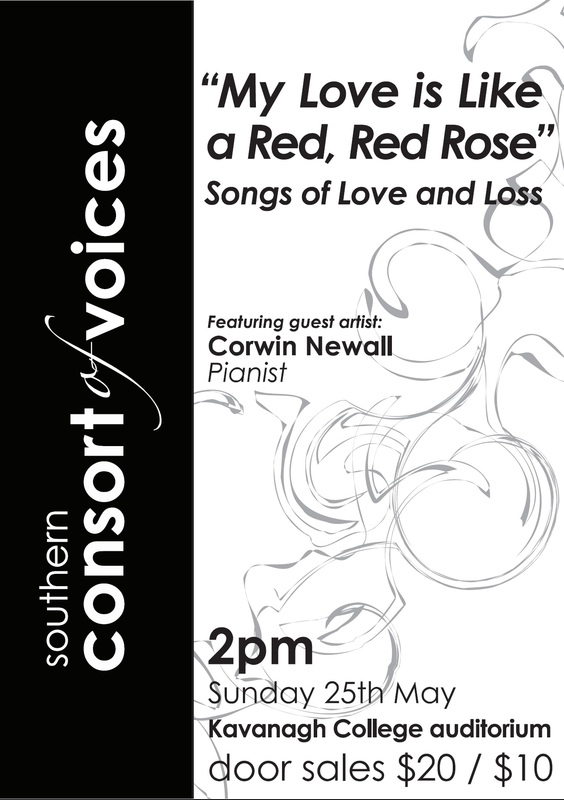 Pianist Corwin Newall, one of Dunedin’s rising talents, joins the Southern Consort to present a selection of pieces for soprano and alto (and some baritone) voices. The concert features famous lyrics — listen for verses by Robert Burns, William Shakespeare, and Ben Jonson — and enigmatic lyrics, notably a translation of the charming 9th-century Irish Pangur Bán. 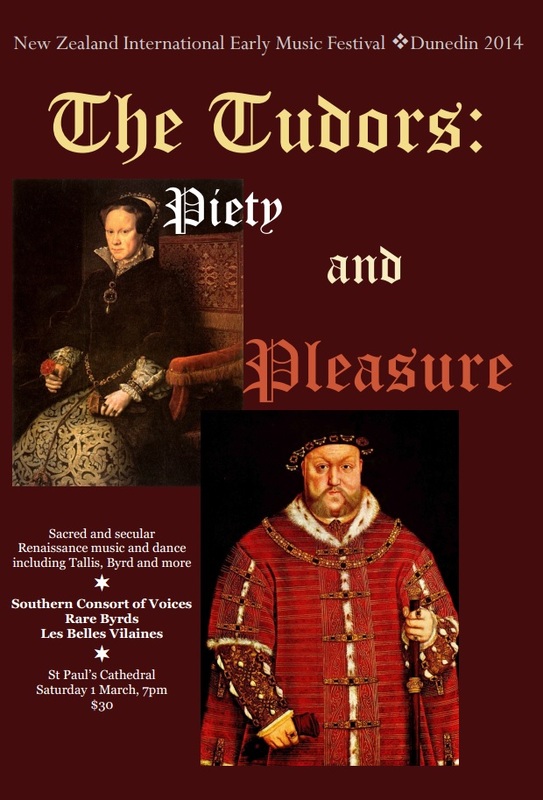 The Southern Consort of Voices sings selections of sacred music by the English composers Thomas Tallis and William Byrd, both devout Roman Catholics who nevertheless were appointed as Gentlemen of the Chapel Royal under Queen Elizabeth I (and in Tallis’s case also her predecessors Henry VIII and Mary I). The Byrd pieces are particularly daring, including a Mass and a setting of Ave Verum Corpus, both dangerously Catholic texts under Elizabeth’s strictly Protestant regime. 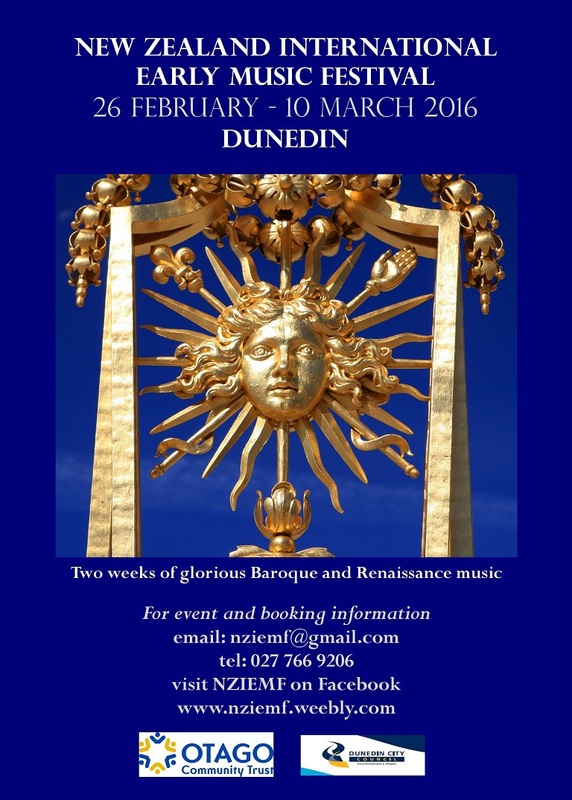 In the second half of the concert, the Rare Byrds, a Dunedin-based early music consort specialising in Renaissance and early Baroque music, join Les Belles Vilaines, a historical dance group established at the end of 2012, to present a sample of Tudor-era songs, poems, and dances: Pavanes, Basse Danses, Almains and Bransles. Dunedinites will be treated to a sublime pre-Christmas concert featuring A Ceremony of Carols, a well-known choral work by British composer Benjamin Britten, written in 3 parts and accompanied by harp. Remarkably, Britten wrote this set in 1942 whilst on board a very rough transatlantic boat journey. The Ceremony of Carols, presented by the Southern Consort of Voices just days before Christmas, will make a fitting closure to a year of celebration. 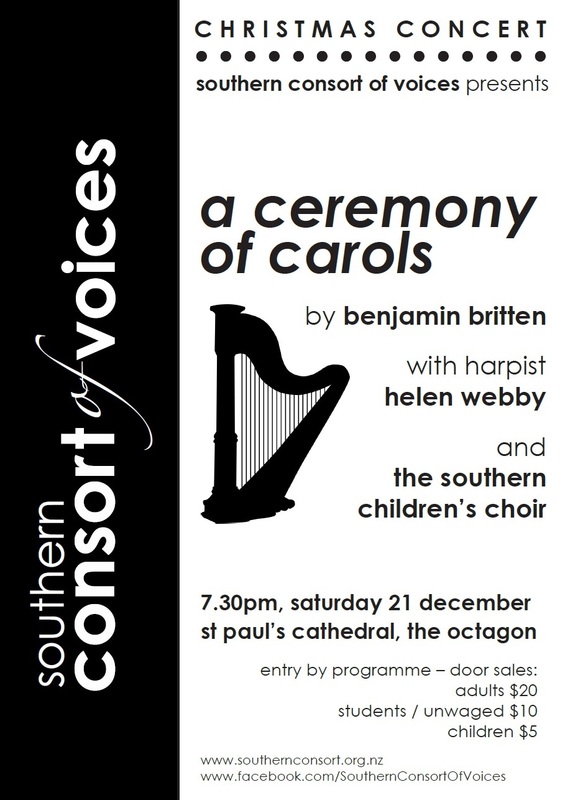 Southern Consort will be joined for this performance by renowned harpist Helen Webby. Webby is the principal harpist for the Christchurch Sinfonia and has recorded a range of CD’s, including a recent album showcasing New Zealand composers such as Dunedin’s Anthony Ritchie. Several members from the Southern Children’s Choir will add a youthful dimension. Michelle Jackson and Catherine Daly-Reeve, both well-established sopranos from the talented St Paul’s Cathedral Choir, will provide solo voices for the lilting Balulalow, and the atmospheric That yonge child. The Southern Consort of Voices breaks with tradition for a fresh spring concert of jazz arrangements for voices. We’ll be singing many of your favourite toe-tapping jazz, do-wop, and barbershop numbers, featuring songwriters as diverse as Cole Porter, Billy Joel, and the Swingle Singers. Featuring a selection of sacred motets ranging from sixteenth century Giovanni da Palestrina to twenty-first century David Childs, via Duruflé, Stanford and others; as well as a performance of Paul Mealor’s beautiful Ubi Caritas, which was composed for the 2012 wedding of the Duke and Duchess of Cambridge. 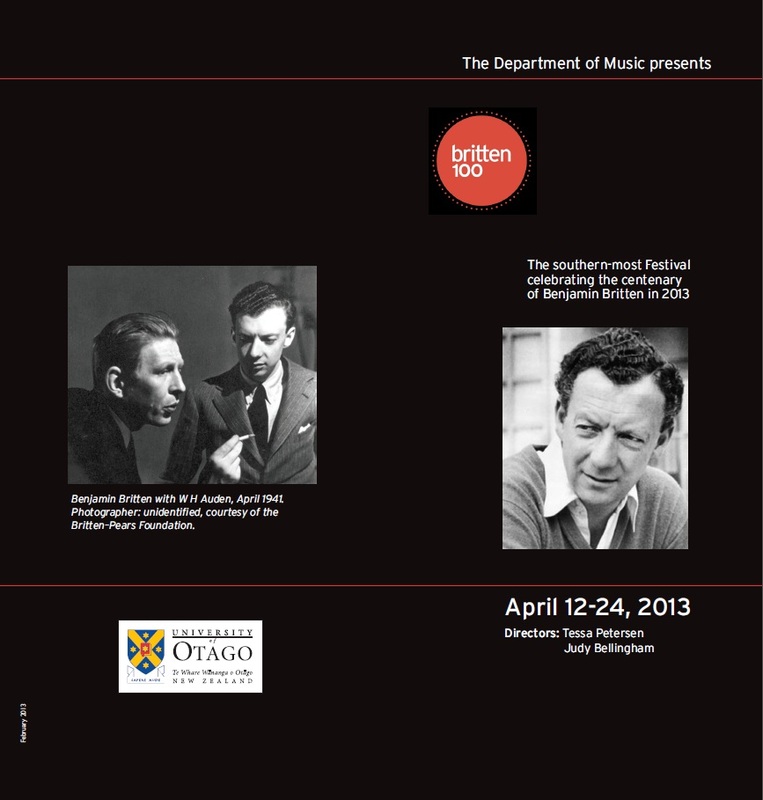 The Southern Consort of Voices joins the Southern Youth Choir and St Paul’s Cathedral Choir in a Choral Celebration as part of the University of Otago Department of Music’s programme of events to mark the centenary of Benjamin Britten’s birth. The programme includes the Choral Dances from Gloriana, the Five Flower Songs, and the much-loved Hymn to the Virgin for double-choir. 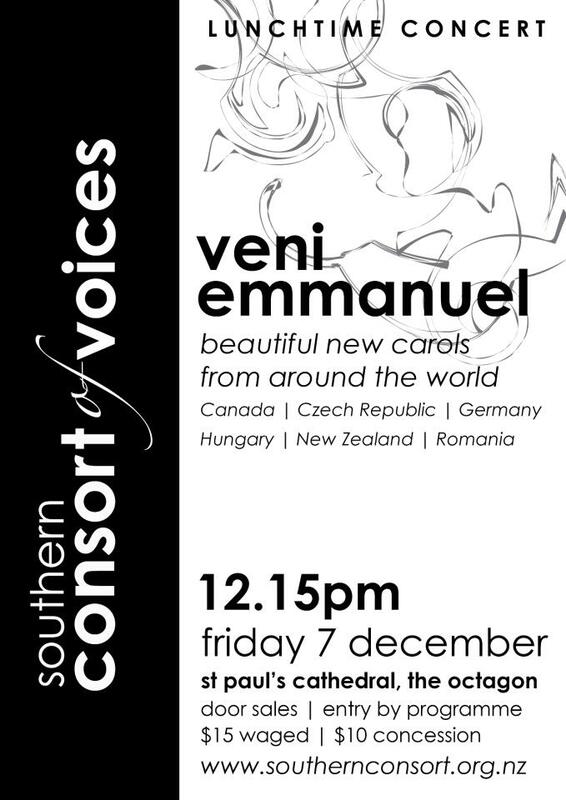 The Southern Consort of Voices presents a Christmas programme featuring songs from Canada, the Czech Republic, Germany, Hungary, Romania, and New Zealand. 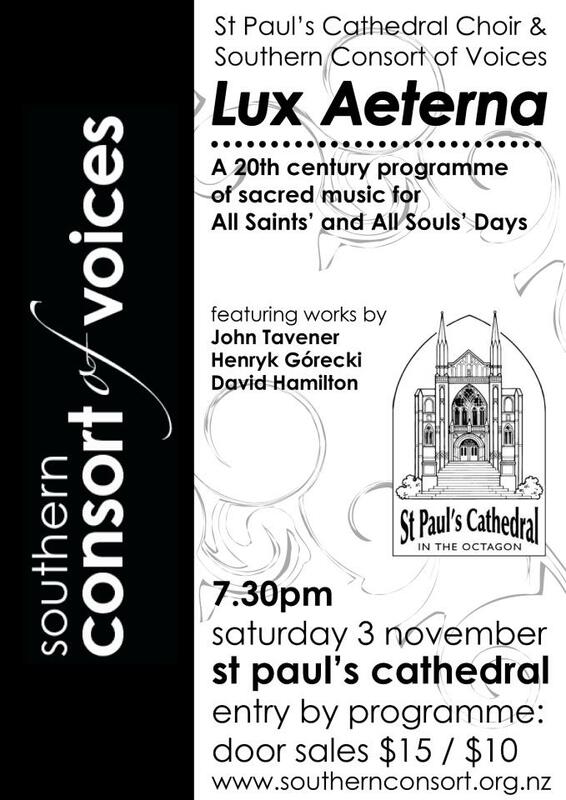 The Southern Consort of Voices and St Paul’s Cathedral Choir present a 20th century programme of sacred music for All Saints’ and All Souls’ Days, featuring works by John Tavener, Henryk Górecki, and David Hamilton. 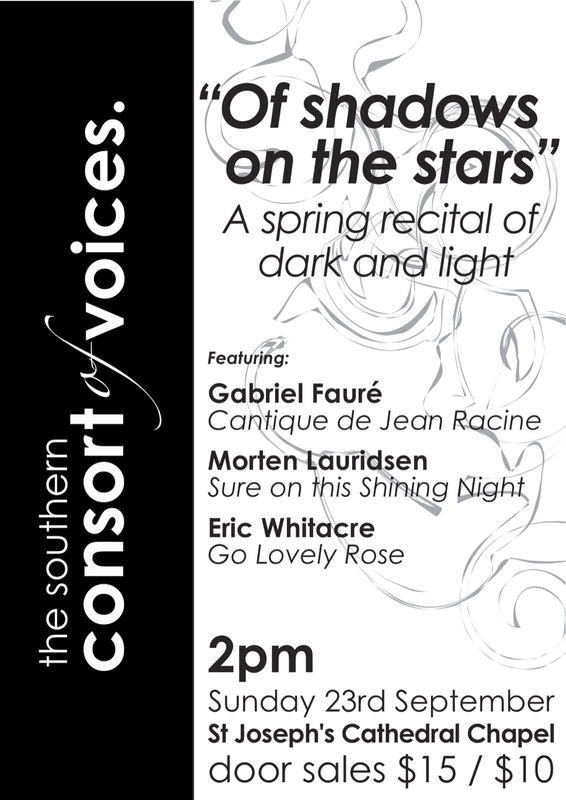 The Southern Consort of Voices presents a spring programme featuring Gabriel Fauré’s Cantique de Jean Racine, Eric Whitacre’s Go Lovely Rose and Morten Lauridsen’s Sure on this Shining Night. 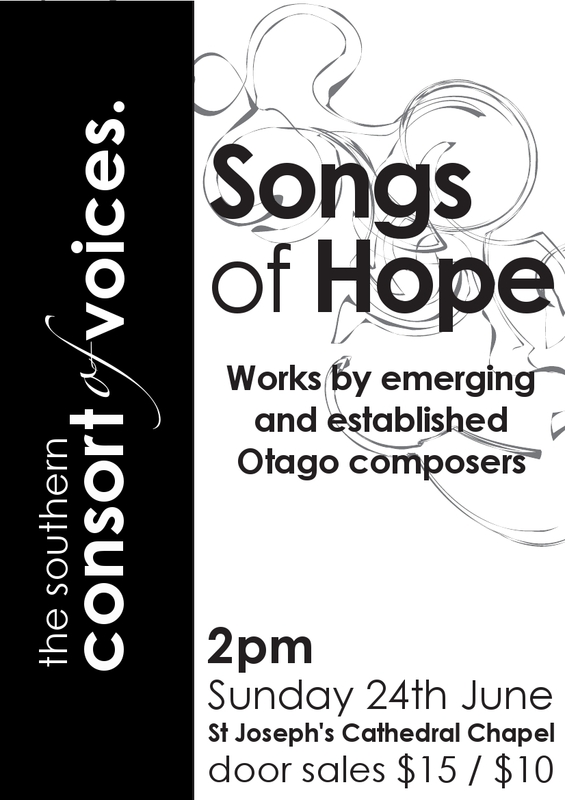 The Southern Consort of Voices presents a mid-winter programme celebrating the work of Otago composers. The programme will include works by emerging and established Otago composers: Alex Campbell-Hunt, Christopher Marshall, Corwin Newall, Anthony Ritchie, Michael Winikoff and Leanne Veitch. 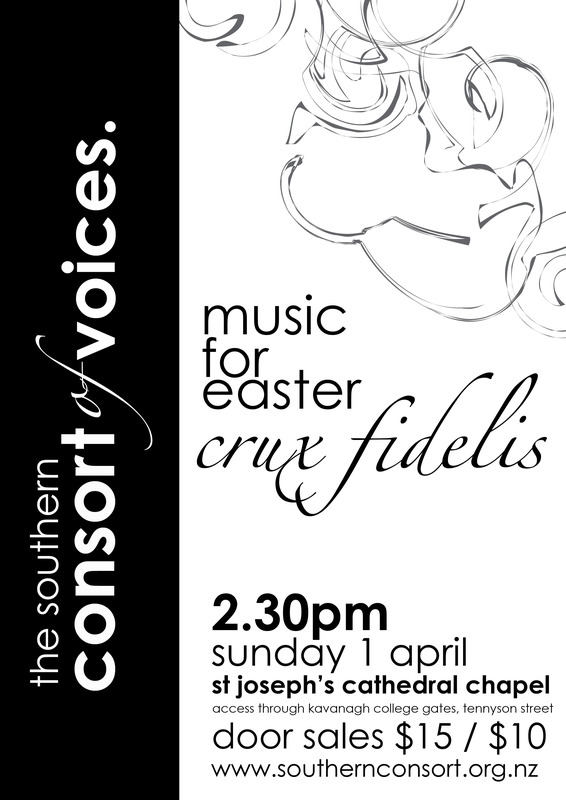 The Southern Consort of Voices presents a program of beautiful and meditative music from across the centuries celebrating Easter. Including works by des Prez, Morales and Palestrina, as well as the sublime Beati Quorum Via by Stanford, the sombre O Vos Omnes by Pablo Casals, and Eric Whitacre’s shimmering Lux Aurumque. St Paul’s Cathedral, 7:30pm, Saturday 1st October 2011. A joint concert of Sacred and Secular works, including works by New Zealand composers David Hamilton (accompanied by Southern Sinfonia’s horn players) and Anthony Ritchie. Also featuring works by Byrd, Purcell, Bruckner, Rachmaninov, Kodaly, Sjolund, Stanford, Busto, Bardos and others. 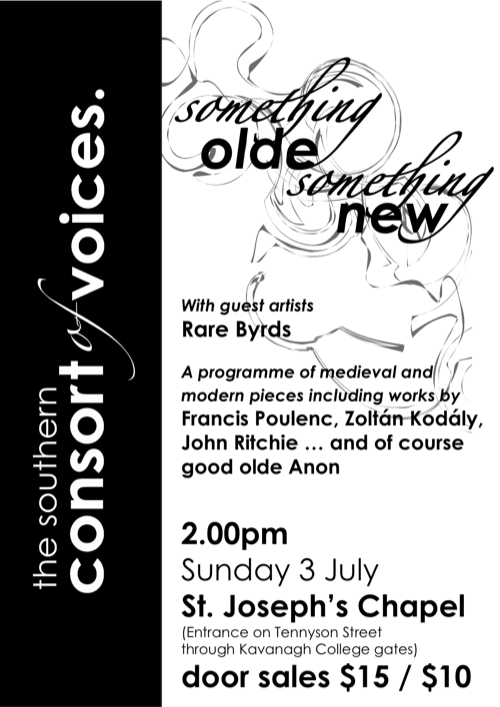 Southern Consort of Voices presented a program of medieval and modern pieces including works by Francis Poulenc, Zoltán Kodály, John Ritchie … and of course good olde Anon! Featuring guest artists Rare Byrds. 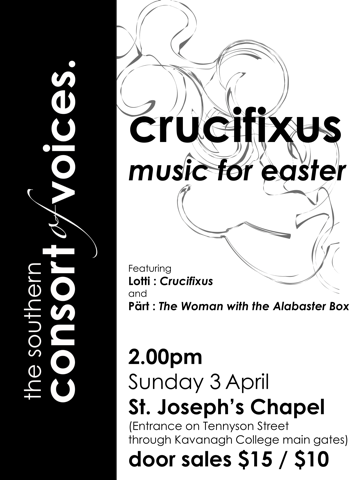 Southern Consort of Voices presented a programme of music for Easter featuring Lotti’s stunning eight-part Crucifixus, Pucell’s Thou Knowest, and including works by Lassus, Tallis, Gibbons, Brahms, Bruckner, Rachmaninov, as well as Pärt’s The Woman with the Alabaster Box. Saturday 4th December 2010, 3pm, Holy Cross Chapel, Mosgiel. Southern Consort of Voices presented a program of glorious romantic music, interspersed with a few carols! The program featured works by Mendelssohn, Bruckner, Rheinberger, Brahms and Grieg. Also included pieces by New Zealand composers John Ritchie, Jack Body and David Childs. 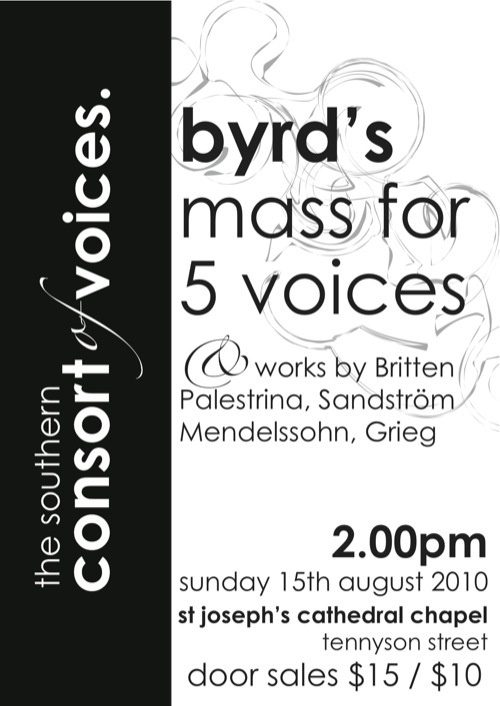 Southern Consort of Voices presented a varied programme of liturgical music across the ages featuring Byrd’s sublime mass for 5 voices, Sandström’s surround sound Es ist ein Ros Entsprungen, and works by Mendelssohn, Palestrina, Grieg, and Britten. 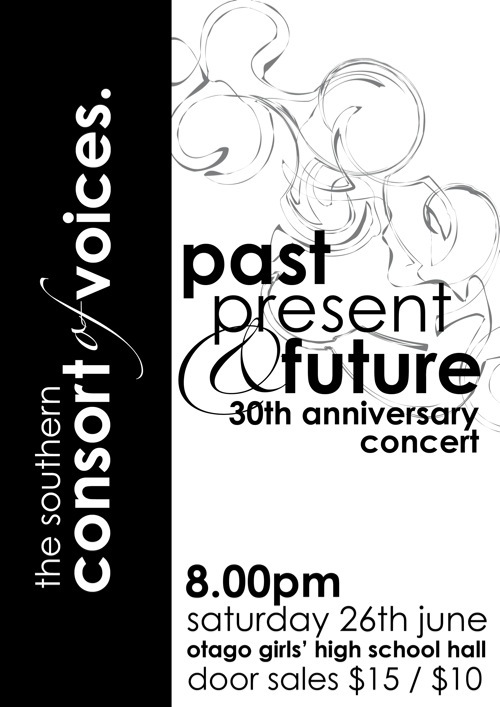 The Southern Consort of Voices presented its 30th Anniversary Concert. In this concert the Southern Consort of Voices looked to the past, and to the future. The choir sang a number of old favourites, as well as some new works, including a commissioned work by Dunedin’s own Anthony Ritchie. The concert was at 8pm, 26th June 2010, at Otago Girls’ High School Hall. 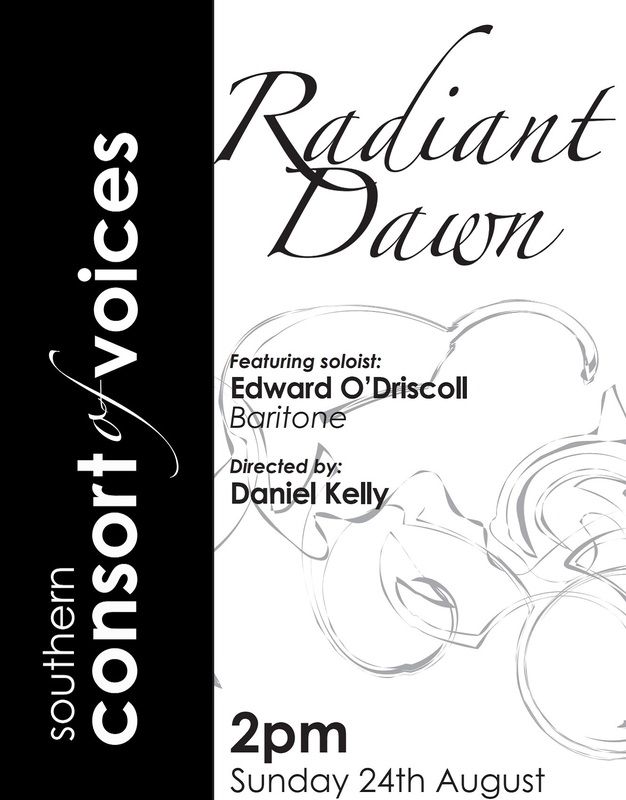 In this free concert the Southern Consort of Voices reprised a number of pieces that had been performed earlier in 2009. The annual Christmas recital from the Southern Consort of Voices will take place in St Paul’s Cathedral on Friday 4 December at 12.15pm. This lunch-time recital has been a long standing tradition with the Consort over the past thirty years. This Christmas concert offers a broad kaleidoscope of festive fare and will offer a refreshingly innovative and new repertoire of Christmas music. From the pen of Renaissance composers Praetorius, Sweelinck and Gabrielli to the exquisite writing of contemporary composers John Tavener, Edwin Roxburgh and John Joubert this recital to bound to create a beautiful pre-Christmas richness. The concert also includes a number of remarkable arrangements, such as Kodaly’s “Veni veni Emmanuel” and Vaughan Williams’ “The Wassail Song”. One feature of the recital is an arrangement of “Es ist ein ros entsprungen”, a traditional German Christmas carol, harmonised by Michael Praetorius in 1609. This new arrangement by contemporary Swedish composer Jan Sandstrom features the familiar tune sung by a quartet supported by shimmering rich harmonies from the choir.